Her pulse pounding in her head and her hands sweaty and shaking, Lipi turned back to the task at hand and in her torch light could make out the path between the closely built huts. Stepping in and over the wet concrete tube-well basin, Lipi was taking care to avoid the slippery wet rim when another muffled cry confirmed their sense of direction. To her left as she glanced up she could just make out the glow of the lights on the Mymensingh town side of the river bank, the 20 concrete steps and her own familiar surrounds in the slum that sprawled out along that bank. Somehow, just seeing it gave her courage as she thought of her own son sleeping safely there. Suddenly a piercing scream brought her back to this less familiar surrounds and what lay ahead of her. Lipi glanced briefly at her husband, as if gaining strength and knocked loudly on the wooden door. Her knock was met by a sudden silence in the muffled voices inside. She knocked again, this time calling out, requesting admission. She was here to help. The reply was drowned out by another long desperate howl coming from inside the hut but this time fading abruptly as if muffled deliberately. Again Lipi knocked strongly and the door opened a crack and the face of an elderly woman appeared – the expression was not inviting. 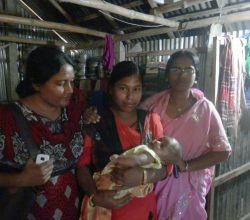 “We are fine!” she spoke in village Bangla but Lipi stepped resolutely forward and pushed through the crack into the tin hut. The room was dark, lit by a hurricane lantern hanging over the bed where the young girl lay. By her side were 2 other ladies, one wiping her forehead and other sitting wearily at the foot of the wooden bed. The older lady at the door spoke first, “we are fine. She will deliver here.” The scene brought back to Lipi strong memories of the final night with her own struggle – the night her first child had been born – and she knew she would not accept that statement. Lipi strode across to the bedside, taking in the scene before her. The young girl was clearly very weak and exhausted, her hair was matted with sweat and strewn across her face, confirming Lipi’s suspicion that her hair had been thrust down her throat as the helpers often did to trigger the gagging they believed would help her force the baby out. There was a strong smell of sweat, urine, vomit… the young girl arched again as another contraction came and her scream galvanised Lipi to action. “How long?” she asked. “Two days… but she will deliver here.” The lady at the door also swiftly crossed the room and roughly pushed Lipi’s hand away as Lipi instinctively reached out to touch the labouring girl. However Lipi was not to be deterred. “It is too long. There is a problem. 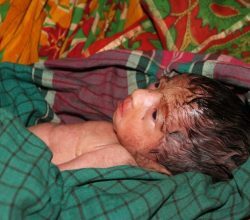 The only chance is if you take her to the Mother and Child Hospital”. This time the lady at the foot of the bed joined in to push Lipi away. “She will deliver normally – here”. Lipi’s own sad experience was backed up by the new knowledge she was learning from Bani, the Symbiosis midwife, and Lipi stood her ground undeterred. Lipi and her husband that night saved the life of the baby boy and quite possibly his 17yo mother as well. As Lipi so totally unassumingly relayed to me some of the details of that night, her face showed the determination and the heart that she has. She also quietly explained that her own first baby died in very similar circumstances because the birth had been obstructed and when her baby was finally born there was no life and happy ending for her and her husband. Photo: Lipi (in pink) with the young mother and baby and Shafali (Symbiosis Skilled Birth Attendant). 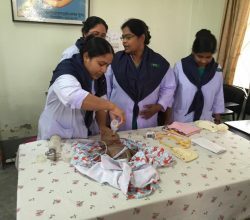 Bani Banowary is a fully trained nurse-midwife , one of less than 1000 midwives in Bangladesh. Bani commenced working with Symbiosis in 2009. 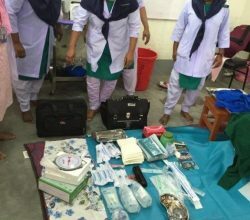 Bangladesh with its population of 160million has a health system that is concentrated in urban hospitals while 70% of the population live in the rural areas. In these rural areas over 90% women still give birth without the assistance of any trained personnel. Bani and 3 Symbiosis staff like Lipi, are very well respected by both the women in the areas of the central north Bangladesh ,where Symbiosis has been working for 21 years, and also by the Traditional Birth Attendants (TBAs) who are the women who assist in most deliveries still today in Bangladesh. I have had the privilege of meeting several experienced and new TBAs and they are wonderful women with an amasing community heart and tremendous courage but are all illiterate and learn from each other. The Symbiosis 3 women staff who have been assisting and learning from Bani, have each been living in remote village areas, going home to home and making contact with young pregnant mothers, the vast majority aged 16-20, and educating them in basic hygiene and nutrition as well as arranging them to attend for antenatal care when Bani is able to visit. These antenatal group visits include the local TBAs who Bani also gives instruction via a laptop and visual aids. 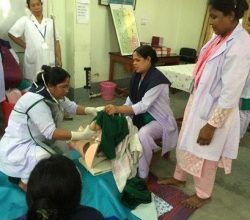 In September 2015, with the funds raised over 2 years by myself and 6 other midwives from Brisbane, Hobart and Perth, we were able to send these 3 Symbiosis women and 1 other to LAMB Hospital in Dinajpur, Bangladesh for 6 months,full-time,live-in course in community Skilled Birth Attendants. We also raised the funds to send Bani to a 3 month refresher – Emergencies in Obstetrics. In March this year, my husband Graeme (who has worked with Symbiosis for 19 years and in Bangladesh since 1986) and I together with 2 of the nurse/midwives visited Bangladesh to encourage Bani and the 4 cSBA trainees as they approached their final exams. Feducci, Shafali, Beauty and Lovely were absolutely thrilled to demonstrate to us their new skills and were full of stories about how they now understood just what had happened with various relatives and friends who had suffered tragedies and serious complications during childbirth. The photos Feducci is demonstrating a normal delivery, Shafali the management of Post Partum Haemorrhage. Neonatal resuscitation was demonstrated by Beauty and Lovely. The nurse/midwives and I also spent a week observing deliveries and care in a rural 100 bed hospital that is well known to Graeme and I. Breastfeeding assistance was heavily in demand. Photos. 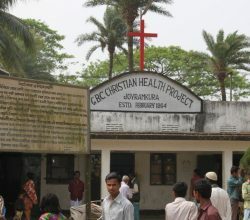 We spent a day visiting 3 levels of Bangladesh government health complexes and clinics and found the care to be sporadic and the hygiene poor, confirming all reports. 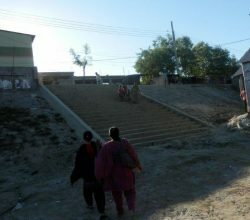 With so few normal deliveries presenting to government clinics, and then only when all other avenues have been exhausted in the village and both mother and baby already travelled long distances and in extreme distress , the expertise in the government clinics lies in performing Caesarean Sections. We also visited Symbiosis work and saw first-hand the groups of women doing their 9 month courses of adult literacy as well as having the absolute joy and privilege of seeing several Symbiosis’ Savings Groups. The Savings Groups are groups of around 20 women who formed together initially for the purpose of learning to read and write but have now continued to meet weekly under the care of a Symbiosis staff worker. The women sit in the shade outside a hut, each has a bank book and they contribute 15 Taka ( approx. 20 cents) per week to the group’s fund. As the funds grow individual women request and take loans from the group for small business projects repaying the loans with agreed small interest. It was so exciting to hear the ladies’ stories of their personal businesses eg duck eggs, goats for milk and meat, small vegetable gardens, tea shop. One group we saw had been meeting for 1 year and they were saving together to buy a bull. Another group had been meeting for much longer and they had many stories of how they previously lived from day to day as their husbands were day labourers and the work very erratic. Now they can send their children to school and also provide for their family and make small profits. This is true “empowering” as the funds are all their own. What Symbiosis gives them is encouragement and assistance in forming the groups, the literacy books and assistance if they need with their small business ideas – unlike microfinance, Symbiosis neither gives the poor money nor makes any money from the poor. So where to from here? 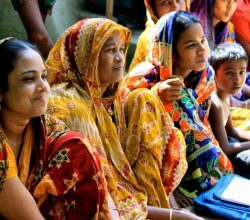 Feducci, Shafal, Beauty and Lovely have returned to their areas of work in Symbiosis now fully trained cSBAs (community Birth Attendants) . 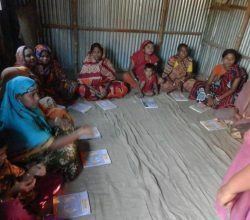 Whereas their knowledge and skills previously were basic and patchy, now they are confident and can work independently to undertake strong antenatal and postnatal care in their areas. They are also trained by LAMB to be able to undertake normal deliveries. 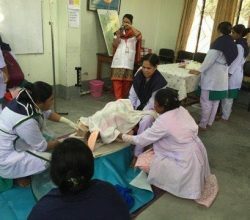 The 4 cSBAs and Bani expressed a strong desire to us to broaden their work beyond their previous antenatal and postnatal care and for Symbiosis to setup a 2-room Safe Birthing Centre so that they can use all their skills that are so desperately needed. Symbiosis local staff are in agreement with their request and have plans underway. However such a clinic would require initial outlay in such capital items as delivery bed, steriliser, lights, generators and rental. 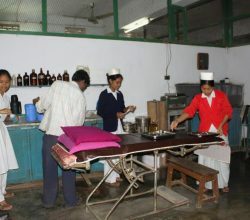 Wages and costs in Bangladesh are low. 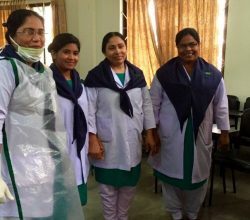 Our desire is to see these 5 Bangladeshi ladies using their new knowledge, education and skills to their full potential as they so desire and as their tutors at LAMB Hospital have every confidence they can. The work costs and wages and delivery supplies can be covered for the total cost of $A8000/ year for each of these 5 Symbiosis staff. We are now hoping to find 5 (or more) sponsors who can commit to making such an impact on the lives of women and babies through such a sponsorship. The long term goal will be to work towards to assisting the rural poor in making childbirth a priority of their saving and to contribute to these costs also.